It is actually Telč & not Telc. Before you go there, you should learn to pronounce its name properly. It is pronounced as Tel-sh. Telč is one of the little heavens of Czech Republic. If you want to cover it from the touristic purpose, it can be a perfect day-trip from Prague. If you are looking at leisure, you should spend at least 2 days to soak in the beauty of Telc. The most beautiful route to reach Telč from Prague is definitely via train. Hop on Cesky Drahy’s train from Prague, get down at Havlíčkův Brod, and change the train from Havlíčkův Brod to reach Telč. It takes about 3 hours 40 mins to reach Telč. Route – Prague – Havlíčkův Brod – Telč. If you are looking for a faster journey, choose the bus. Bus from Prague takes about 2 hours 40 mins to reach Telč. We stayed at a property (by the lake) called Camp Telč. Perhaps the most beautiful area of all European towns & cities is their town squares or city centres. Telc is not an exception. Its beautiful historic centre is a UNESCO World Heritage site. Around this beautiful centre, there are pretty houses all around. It’s a good mix of Renaissance style, Gothic style & Baroque style of architecture. You will might most of the souvenir shops, eateries & markets in the centre. Most of the other attractions of Telc are within walking distance from here. The Chateau was definitely the highlight of our trip. We were shown around the chateau by the official person. It was interesting to know about the royal family & their stories around this place. Do not miss this chateau & take a full tour of the place with the official guide. The look-out tower is a little away from the centre but the visit is totally worth it. From here, you can see the entire town of Telc from above & its truly mesmerising. Earlier the tower used to be wooden but now its of steel. Don’t be fooled by the name. This museum is nothing like any museum that you might have seen in past. 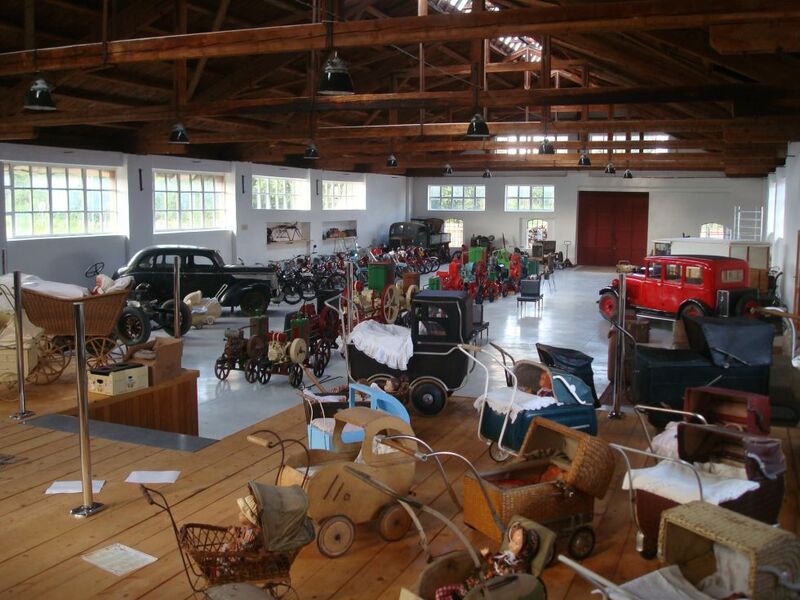 Technical Museum contains a lot of vintage models of cars, bikes, motorbikes, radios, telephones & other technical stuff. Every item is preserved very well & there’s a lot to go OMG on! One of the must-visits for sure. Telc Underground is a place where history meets technology. The historical tunnels are now equipped with latest 3D projection technology. Because of this, you can see the history of Telc, houses & other interesting information with projection, interactive tables etc. If you are traveling with kids, do take them here. They will remember it for a long time. Its not enough to just admire the beauty of Telc houses. One must understand its history & legends. To know more about it, head to House no. 31 which has been converted into a permanent exhibition. The pretty church of St. James is standing tall since the inception of the town itself. With an amazing defense system, Telc was once an unconquerable water fortress. The church is still surrounded by ponds. It is a real peaceful place. One of the most interesting churches I’ve ever been to. It’s history is somewhat disputed but that shouldn’t bother you in any way. The tower is supposedly the oldest structure of Telc. To know more about the town, check out Telc Tourism’s official website & Czech Republic Tourism’s official website for more information.